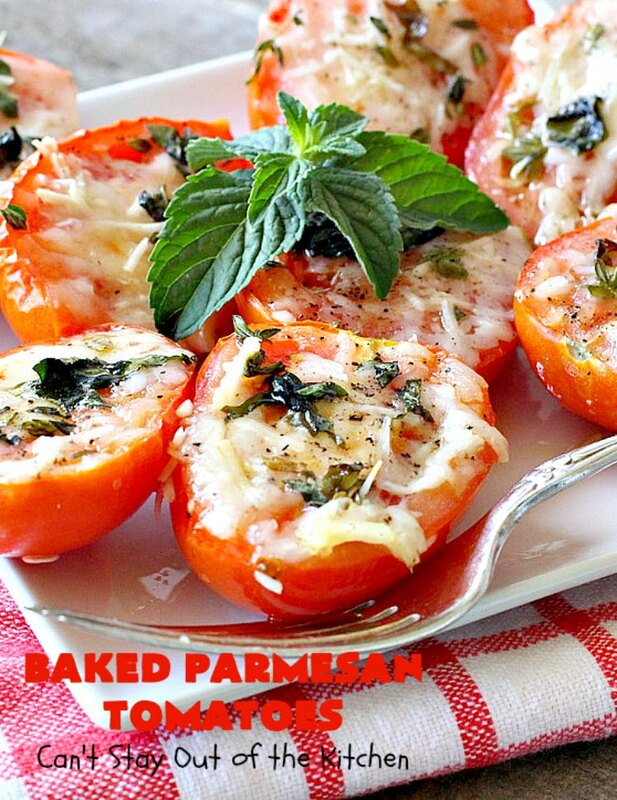 Baked Parmesan Tomatoes are awesome. I love tomatoes. Whether in sauce, roasted or fresh, I think tomatoes are my favorite vegetable fruit. 🙂 These lovely jewels are covered in parmesan cheese and sprinkled with salt, pepper, fresh oregano and basil and olive oil before baking. They come out absolutely mouthwatering. The really nice thing about this side dish is it really doesn’t take long to prepare either. 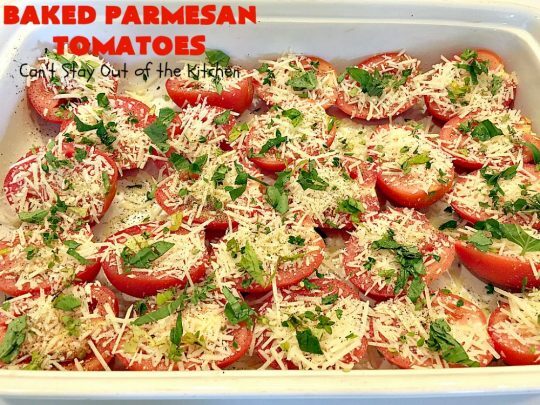 You end up with a scrumptious healthy and gluten free side dish that’s perfect for any occasion. We host a Bible study in our home every Friday night. I usually make the main dish and a couple of other things to go along with it. The week I made these tomatoes, I made up a batch of Paula Deen’s Bacon Cheeseburger Meatloaf and a Shoepeg Corn Dish. It was a real comfort food meal and everyone really enjoyed it. While I make main dishes because I have to, I make casseroles and side dishes because I love to. Seriously, ask my kids. I’ve always been known as the “casserole queen.” For me, it’s just a lot more fun to find creative ways to make side dishes. A couple of months ago I was looking through my cookbook recipes for inspiration. Finally, I decided to make roasted tomatoes but with parmesan cheese instead. 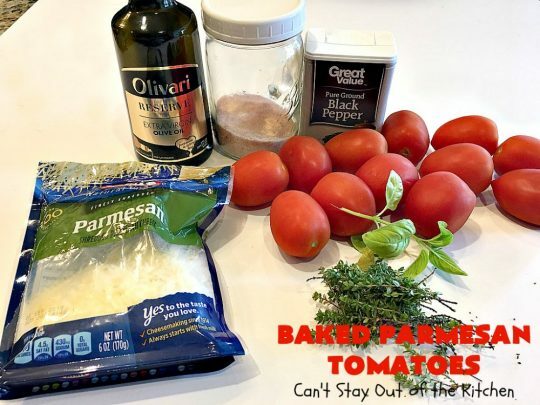 While I used olive oil (because I love the flavor), you can use avocado oil for this recipe with equally great results. I had quite a bit of fresh oregano and basil in my herb garden so I went with those herbs. Though I had many other herbs to choose from, I decided to keep it simple. This recipe takes about 10 minutes to get oven ready. That makes it much quicker and easier than many casserole recipes. Plus it only takes about 15 minutes to bake so you can have this side ready in less than 30 minutes. On top of that, this gluten free side dish is healthier and lower calorie than many casseroles too. 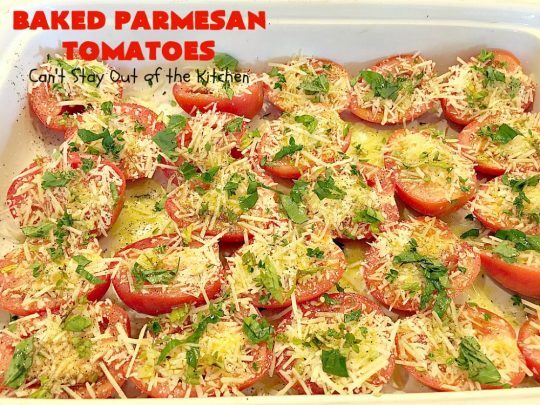 This delectable side dish is marvelous for company or holiday dinners, like Easter, Mother’s Day or Father’s Day. 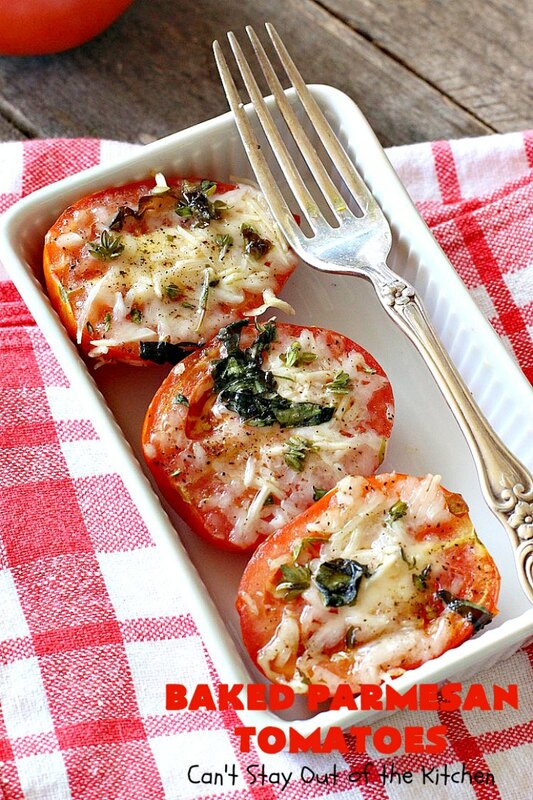 Put Baked Parmesan Tomatoes on your menu soon and you’ll see why we enjoyed it so much. 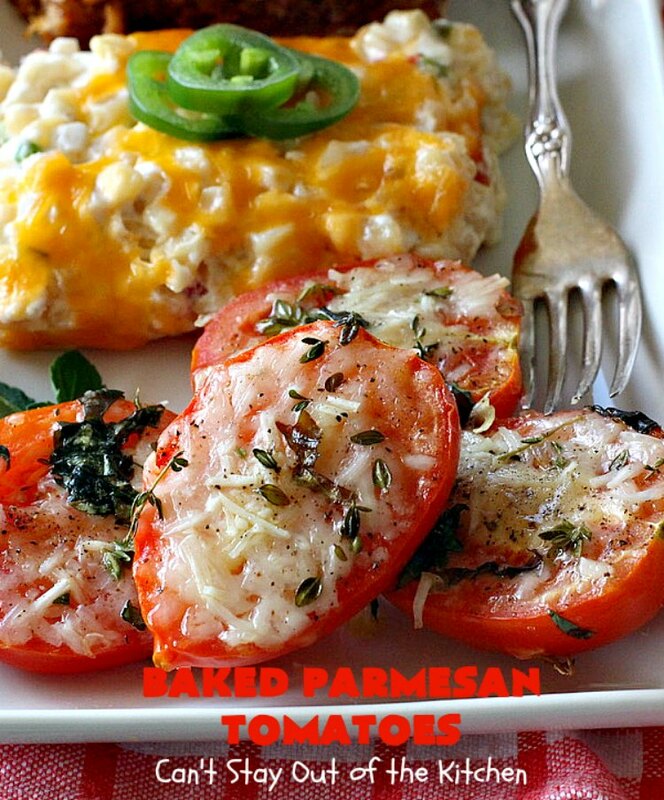 Baked Parmesan Tomatoes are scrumptious. I served Baked Parmesan Tomatoes with Paula Deen’s Bacon Cheeseburger Meatloaf and Shoepeg Corn Dish. So delicious. 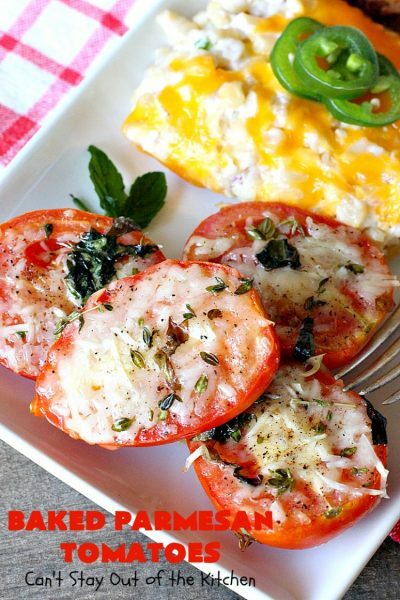 If you enjoy tomatoes, you’ll love this delightful side dish. 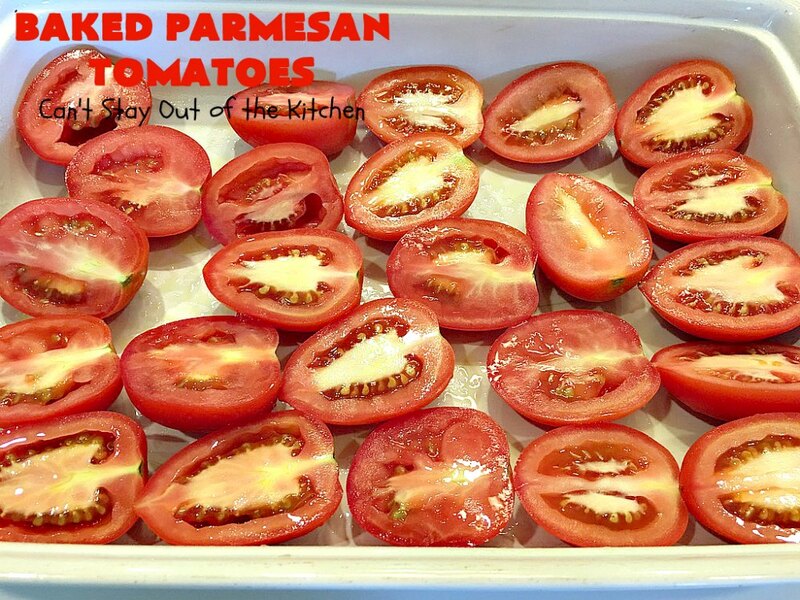 Baked Parmesan Tomatoes is a great side dish to make when you have a bumper crop of tomatoes! I used these ingredients. However, I used a lot more fresh basil than what appears in the picture. Slice Roma tomatoes in half lengthwise. 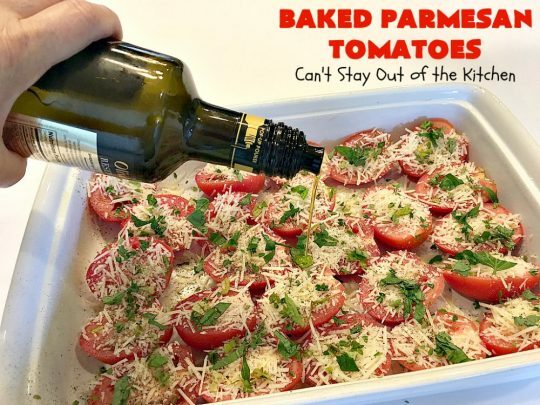 Spray a 9×13″ glass baking dish with olive oil cooking spray. Place cut-side-up in prepared baking dish. Sprinkle parmesan cheese liberally over the tomatoes. Sprinkle with salt and pepper. Spread chopped basil and oregano over top. 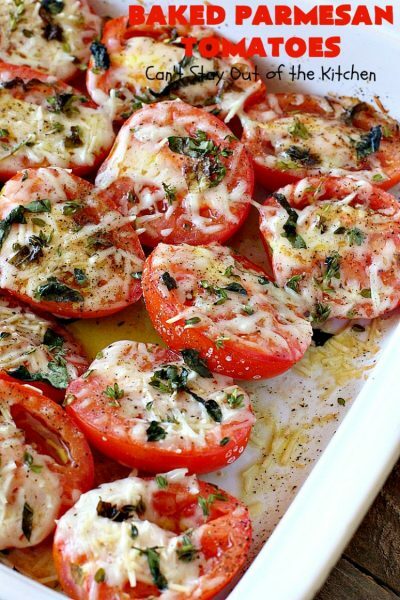 Try to coat the tomatoes well with the olive oil. Bake at 450 about 15-20 minutes or until tomatoes are tender. 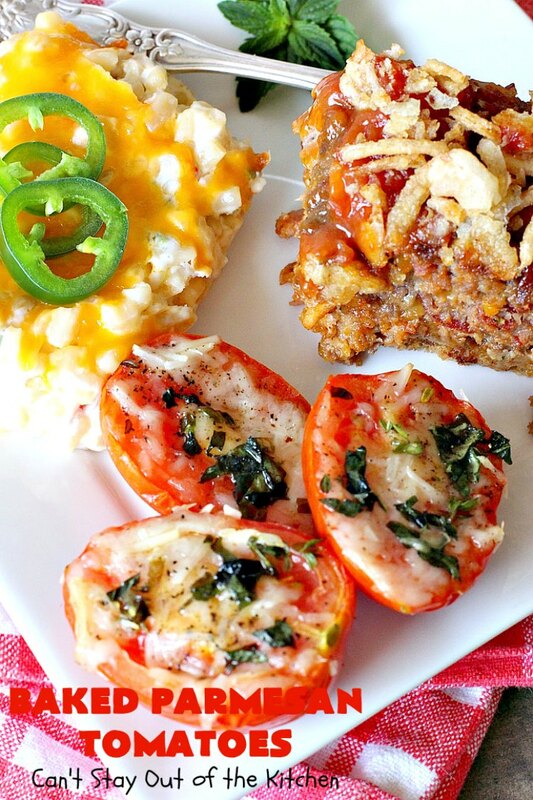 Bacon Cheeseburger Meatloaf, Shoepeg Corn Dish and Baked Parmesan Tomatoes makes a wonderful meal for company or holidays. 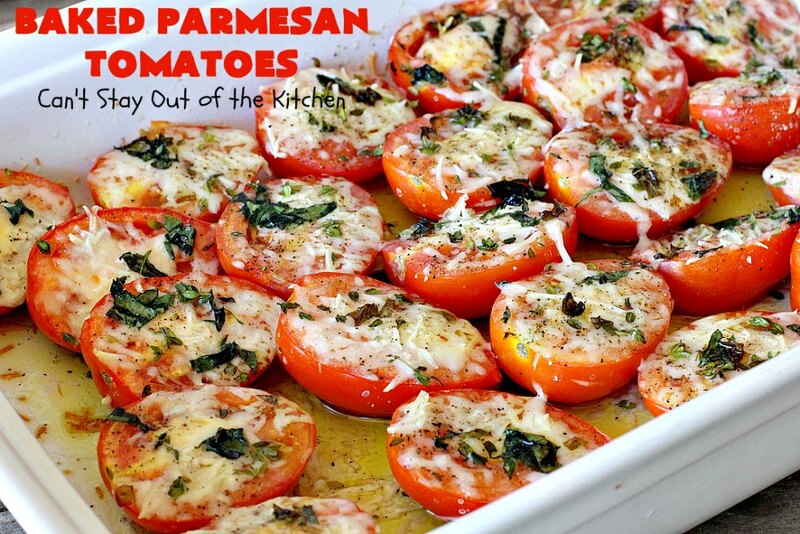 This recipe is somewhat similar to my Roasted Italian Tomatoes. However, this dish includes parmesan cheese giving it an entirely different flavor. 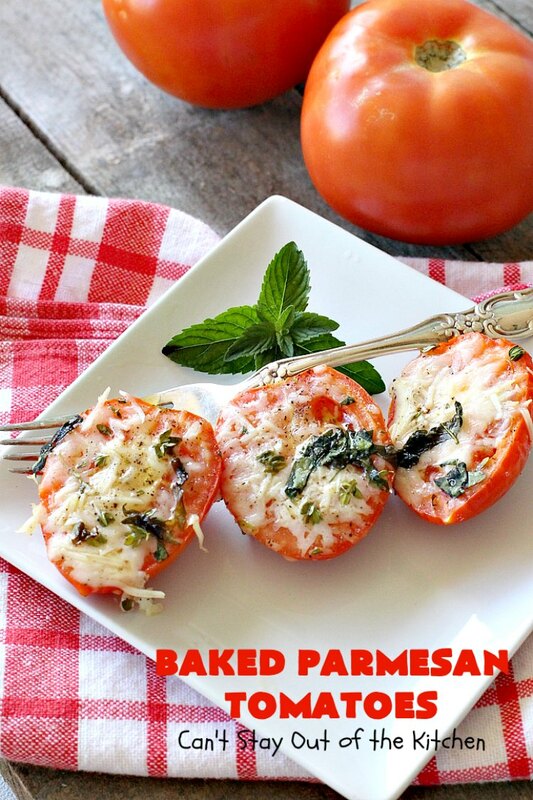 Baked Parmesan Tomatoes are absolutely mouthwatering. 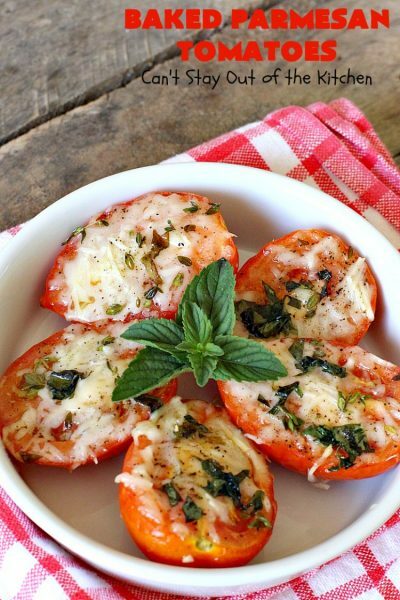 Tomatoes are sprinkled with parmesan cheese, fresh oregano and basil. Then they're drizzled with olive oil before roasting. This easy and delicious side dish is terrific for company for holidays like Easter, Mother's Day or Father's Day. Gluten free. Spray a 9x13” glass baking dish with olive oil cooking spray. 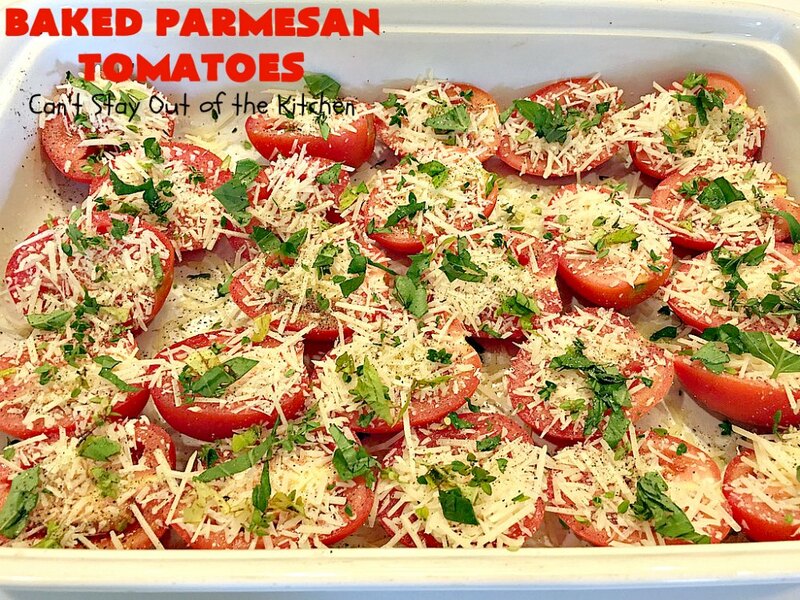 Place tomatoes cut-side up in prepared baking dish. Sprinkle generously with salt and pepper. Sprinkle Parmesan cheese over top. Spread freshly chopped oregano and basil over all. Drizzle evenly with olive oil. 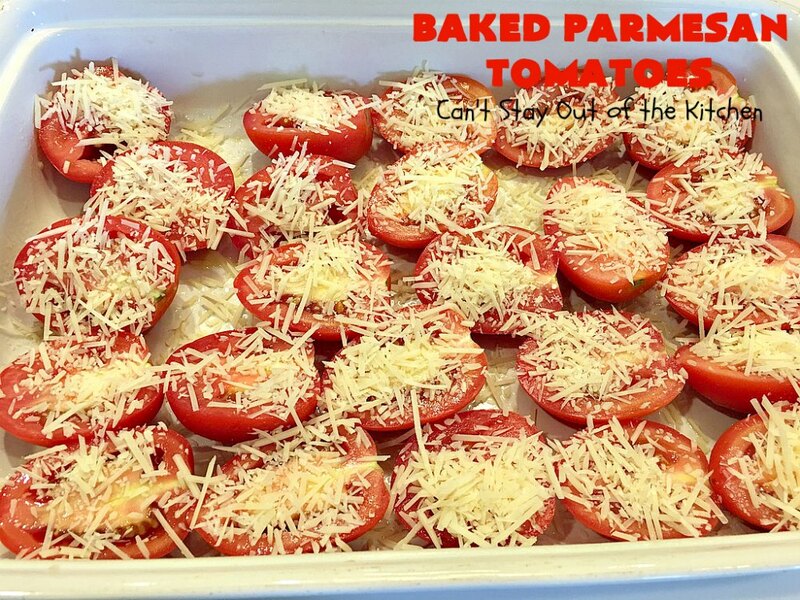 Bake, uncovered, until the tomatoes are tender, about 15 minutes. 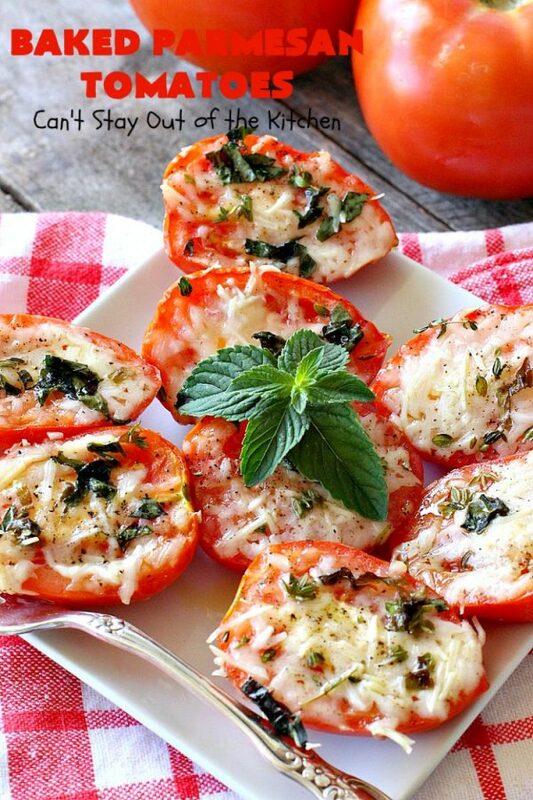 Baked Parmesan Tomatoes are delightful. This quick and easy side dish takes only about 10 minutes to prepare and 15 minutes to bake. Our company loved tomatoes made this way. The parmesan cheese and fresh herbs dress up this veggie making it spectacular. You may find these items helpful for making this dish.